Apple and Herb Turkey Brine infuses wonderful flavor into the meat and helps keep it juicy while roasting. Plus, it’s easy to prep ahead! Let’s talk about turkey. More specifically, dry turkey. The kind that crumbles when you slice it and would probably qualify as a choking hazard without copious pools of gravy to save the day. If you don’t know what I’m talking about, I envy you! When cooking a large bird, it can be easy to fall into the dry meat trap. Like many others searching for a solution, I discovered brining years ago and have never looked back. 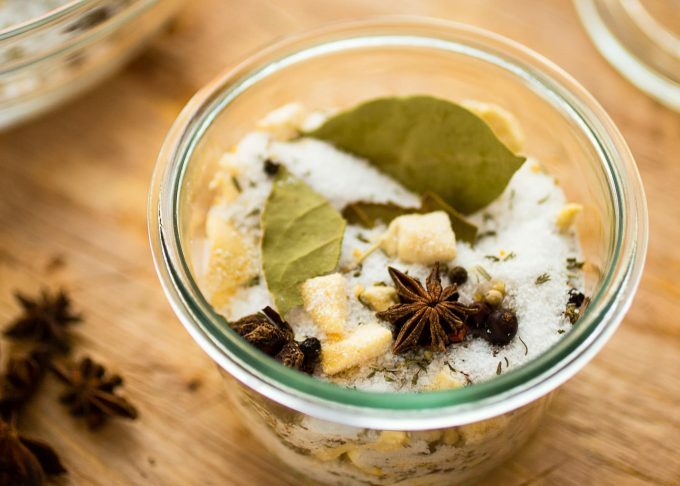 Soaking your holiday bird overnight in a seasoned salt solution such as this Apple and Herb Turkey Brine infuses wonderful flavor into the meat and helps keep it juicy while roasting. It’s also easy to make. We all need as much “easy” during the holidays as possible, right? When brining first became the “It” thing in holiday home cooking a while back, I purchased pre-mixed brining blends from various gourmet stores. They were delicious, and my turkeys were consistently juicy and flavorful. Once I got acquainted with my local spice shop, I realized that I could recreate my favorite commercial brines at home, with my own customizations. 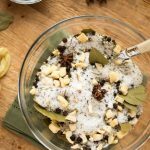 This Apple and Herb Turkey Brine combines the best flavors of my favorite commercial mixes—dried apples, rosemary, thyme, peppercorns, star anise, onion, garlic, bay leaves, and juniper berries—with whole cloves and a touch of brown sugar. The blend has become a favorite at our holiday table. I also love the delicate touch of sweetness that using apple cider adds to the roasted turkey, further softening the salt flavor while still tenderizing the meat. As for the type of salt used for brining, most of the gourmet mixes use a coarse sea salt, but I find that it’s a luxury that isn’t totally necessary for a home blend. I use Kosher salt with great, and more economical, results. Why not brine with fresh herbs, you might ask? Convenience. I make this brining mix ahead of time and keep it in an airtight container on my pantry shelf. It also makes a nice seasonal gift, packaged in canning jars with a festive ribbon and brining instructions written on a decorative tag. How fun to surprise a fellow food nerd with a unique, homemade hostess gift! Sealed, this dry mix will stay fresh at room temperature for several months, but I can guarantee that once you taste the fantastic turkey it produces, it won’t last that long! Did you know I have a weekly newsletter? It’s a great time of year to subscribe and have delicious recipes delivered to your Inbox for all of your holiday entertaining needs! 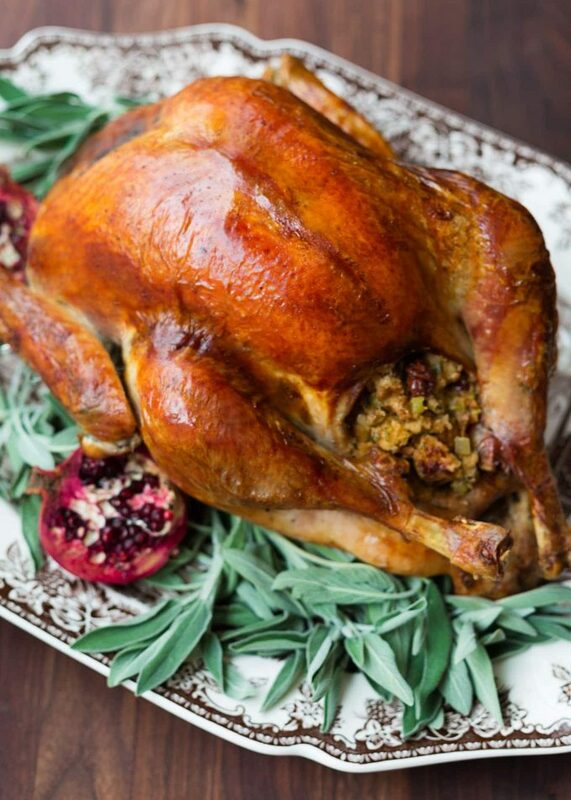 Apple and Herb Turkey Brine infuses wonderful flavor into the meat and helps keep it juicy while roasting. Plus, it's easy to prep ahead! Inspired by my favorite commercial brine mixes. Combine salt, sugar, herbs, spices, and apples in a large bowl. Mix can be made ahead and stored at room temperature in an airtight container. Combine brine mix and 1 quart apple cider in a heavy-bottomed saucepan. Simmer over medium heat for 5 minutes, stirring until salt is fully dissolved. Remove from heat and let cool to room temperature. Refrigerate until chilled. In a large stock pot, stir together cold cider mixture with remaining 3 quarts apple cider and all of the cold water. Submerge turkey in the pot, or pour brine over turkey in a large brining bag (see brining tips below). Cover and let soak 8-12 hours. Remove turkey from brine, rinse well inside and out, and dry with paper towels. Discard brining liquid. Follow your favorite roasting method, remembering to omit any salt added to the turkey. Be sure to use a turkey that hasn't been "enhanced" or injected with broth or other flavorings. *Allergy note: pink peppercorns are related to cashews and can invoke a reaction in guests with tree nut allergies. The turkey needs to be totally submerged in the brining liquid. Any non-reactive deep vessel (a huge bowl or deep pot) covered with plastic wrap will work for this. The turkey can be weighted down into the brine with a plate turned upside down and a large can. I like using the plastic brining bags available in most kitchen stores, turning the turkey in the bag halfway through the soak. My favorite have both zip tops and plastic clips for added peace of mind. To brine a turkey breast (6-7 pounds) instead of a whole turkey, halve the recipe and reduce brining time to 5 hours. I most often use a butter-soaked cheesecloth method such as this, as outlined by Martha Stewart. I am loving all of the Fall flavors in this dish! I think I’m going to have to give this a try on my turkey this year. This combination sounds like a great brine! I think it would also work well for pork and chicken too! A great thing to have on hand all year round. This is super scrumptious looking turkey! love your brine herb idea as well. I don’t typically make a whole turkey for thanksgiving, but I make two or three whole chickens and flavor them differently. I may have to try this brine for one of them, Thanks for sharing. I’m not often in charge of the turkey for Thanksgiving but brining it is definitely the way to go for great flavor and taste! 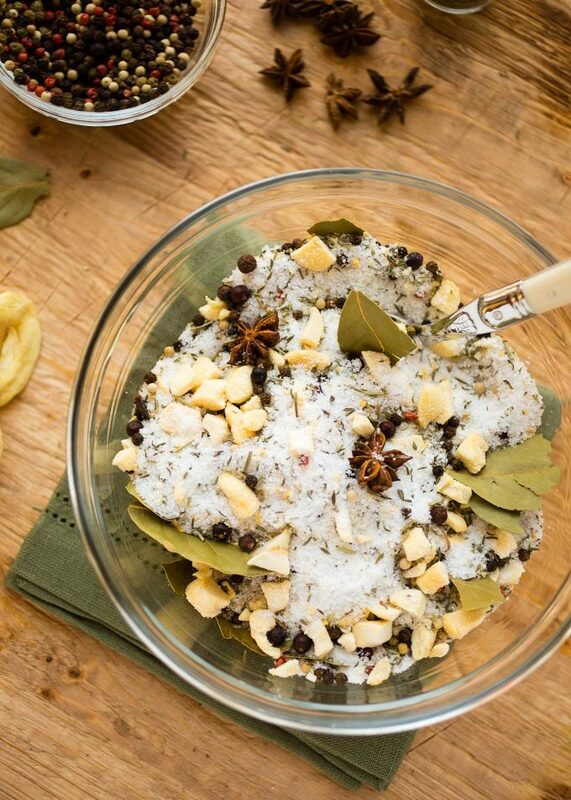 I’ve got to try this brine mixture! I’ve definitely consumed a good bit of dry turkey in my day. I usually skip brining a turkey because I’m a pretty lazy chef in the kitchen, but I think I could do this one! 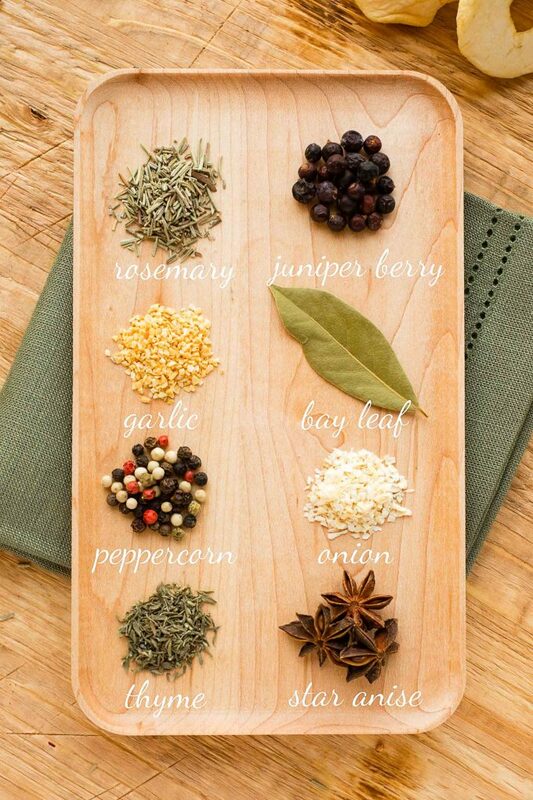 I like that you use dry herbs – sometimes fresh are hard to find in my area this time of year and I like to keep an assortment of dried around for convenience myself. :) Your photos are incredible and the turkey has my mouth watering! This sounds absolutely delicious..!! I love turkey but we are a small family so we never buy the whole bird. I’m going to use this method on a big chicken. I’m sure it will taste delish too. This looks absolutely delicious and tempting and the pictures are great! Once, I was invited to a friend’s house for a turkey dinner, but not at Thanksgiving. She proudly served me a combination of light and dark meat. I bit into the white meat and almost choked it was so dry. I’d never tasted anything so dry. She bit into the breast and said. Oh no! This is all wrong. The breast isn’t dry enough. Apparently, that was how she thought it was supposed to be. I assured her that it was VERY dry as I asked someone to please pass the gravy. I am just beginning to explore brining meats. I haven’t tried a turkey, yet. This combination sounds very good. Where do you find brining bags? I’ve never seen them at my grocery store.